Whether it’s with mascara, lash extensions, or false eyelashes, women have long sought out lush lashes to better frame their eyes. But, what if you could get a fuller fringe by growing more of your own, natural lashes? That’s the appeal of lash growth products—but they’re not all created equal. Of all the products touted to aid in helping you regrow your own lashes, there’s only one so far with proven results: prescription-only Latisse®, by Allergan. 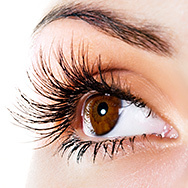 Latisse’s active ingredient is a topical drug known as bimatoprost. It was originally (and still is) used as a medical treatment for certain eye conditions. Over time, doctors noticed that their patients using bimatoprost eye drops started growing longer, fuller, and darker eyelashes. Numerous studies found that bimatoprost repeatedly led to the same result, and so Latisse was formulated for the specific purpose of being a brush-on lash growth product. Latisse does come with some caveats. It’s not inexpensive (a two-month supply runs about $160) and there can be side effects. The most common side effect is redness on the areas where it’s applied, along with the risk of permanent brown pigmentation of the iris. That aside, results from Latisse have been proven time and again, and it’s incredibly simple to use. All you have to do is apply it to the upper lash line nightly, and, in a few weeks, you’ll see noticeably fuller lashes. You might read online that similar drugs—latanoprost and travoprost (which are used to treat the same eye conditions as bimatoprost)—also can increase lash growth. While some studies have shown that to be the case, neither drug has been approved yet by the U.S. Food and Drug Administration for this use. One other note: A recent study found that a man treated with the oral medication ruxolitinib, which has been shown previously to help regrow scalp hair, experienced unexpected lash growth. More research is needed to determine if this was an anomaly or if it really is another way to make lashes grow longer, but it’s an encouraging find! While research shows that Latisse is the only game in town as far as real results when it comes to lash growth, that hasn’t stopped claims about a number of alternatives being successful as well. From expensive solutions containing proprietary peptide blends to at-home remedies of castor oil and coconut oil, there’s no shortage of so-called solutions for sparse eyelashes. Ultimately, they don’t work. Many people report that using these methods results in a boost in lashes, but that’s not actually what they’re seeing. Applying peptides or non-fragrant plant oils to lashes can have a conditioning effect on them, leading to less lash breakage and loss. Long story short: Those aren’t new lashes coming in that people are seeing—they’re just the existing ones sticking around longer before they naturally shed and are replaced with a new eyelash. Now that you have the inside scoop on what really works, it’s up to you to make the decision whether Latisse is right for you, or if you’d prefer to enhance your lashes by using mascara alone.